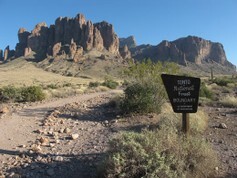 Join us on the Tonto National Forest for another hike into Arizona’s historic Camp Reno, a U.S. Army camp established in the Tonto Basin in 1868. It was constructed to protect trade and travel routes and, later, became a focal point for ranching and mining operations. This year, we will revisit the site to continue our goals of locating and recording structures and features associated with the historic military outpost, preparing maps and documenting artifacts. We will also excavate a looter’s pit, to see what damage may have been done to the site, and to see “what lies beneath.” Metal detectors will be used extensively during the fieldwork to add to our already extensive and fascinating assemblage. So, we hope to see you this spring as we once again delve into the past at Camp Reno!